This is the new edition of the “two way system” which was first commecialized in 1996. 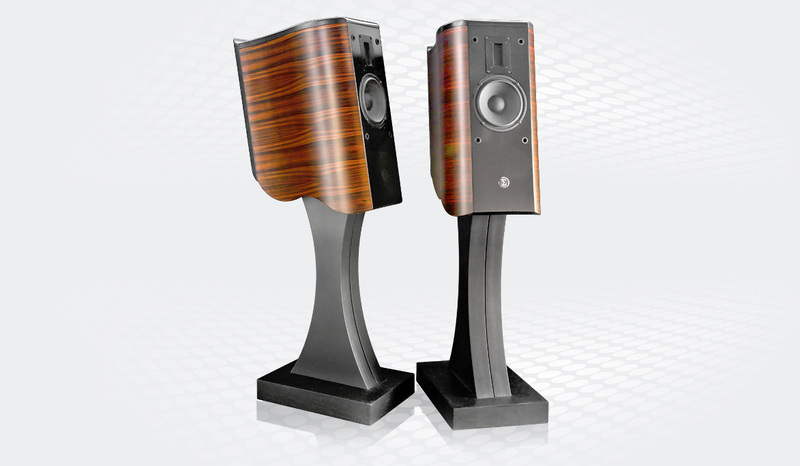 The older model was a best-seller among Extreme Audio enthusiasts. The new cabinet shape and tweeter are striking the conosseur as a development of the older model, the sonic imprint though, reminds of the typical Extreme Audio sound. These speakers are quite an easy load for amplifiers, be it transistors or vacum tube . Even low power triode amplification will prove satisfactory. The new Overtures are also very adaptable and easy going as far as room placement is concerned. The new model is still a 2 way, bass reflex standmounted speaker which portrays music in an armonic and dynamic way, also thanks to it’s newly developed crossover. Years of experience, technical fine tuning and know-how will make it possible for the listener to enjoy an emotional, detailed and involving, though relaxed sound. The inclined front baffle ensures pin-pointed detail retrival; the low mass woofer fits very well the new and perfected AMT tweeter, offering very natural and fast transients in music. The woofer is a 16 cm. paper and polipropylene sandwich unit; being very light it’s mid-bass will follow the very agile tweeter perfectly, but still going quite deep in bass excurtions, more then anyone could expect from such a “small box”. The handmade crossover design is a 6db x octave component with “free cable” construction. All speakers, as usual for Extreme Audio, are hand crafted, components are carfully chosen, singularly tested and matched. The finished product will be sonically assessed, tested and only then will leave our factory for final delivery. Bi-wiring and bi-ampling are welcome options with the Overture series. Cabinets are made from a sandwich of MDF and wood with different thickness, pressed together. This allows fine tuning of resonances and is effective in absorbing deleterious vibrations. Cabinets are then further hand polished (depending on the requested finish) and are obviously all produced in Italy. The finishes on offer vary from cherry, oak, rosewood, walnut and ebony veeners as well as black satin. A dedicated stand with matching finishes it’s also on offer and will be furnished on request. Wf Sandwich polymer high diameter coil. Sensibility (in listening surrounding) : 89,5 dB. Max power : 130 W.
Power suggest : 10 – 130 W.
Frequency response : 38 – 30000 ± 3 dB.